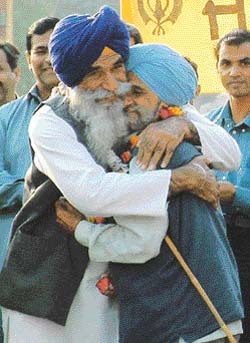 THE numerical strength of the Sikhs in Pakistan is almost insignificant. Less than 50,000 of them are spread over East Punjab, Peshawar and other parts of the country. Owing to the unfavourable state policies of Pakistan towards minorities, Sikhs, Hindus and Christians barely get absorbed in government jobs. As a result, literacy among Pakistani Sikhs and Hindus is extremely low. Most of the Sikhs, who are engaged in petty trade, do not send their children to schools. Sikhs, however, enjoy ‘more liberty’ than the Hindus due to the ‘hidden agenda’ of Pakistan. Hindus who met this correspondent in Pakistan expressed their anger and helplessness over the abduction of their girls by Muslim youths. Sikh girls, however, are spared this humiliation — only two Sikh girls have been abducted since the Partition. Pakistani Sikhs, no doubt, had taught Gurmukhi to their children so that they could recite the holy scriptures but hardly any member of this community has enrolled in a college or a university till recently. 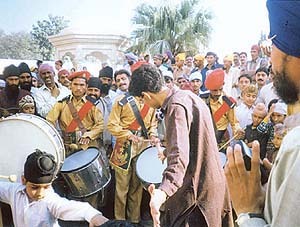 However, with globalisation of education, an awakening has been witnessed among Pakistani Sikhs. Gulab Singh, a resident of Nankana Sahib, is doing his graduation from the Homeopathy College, Lahore. Other residents of the same town, Mimpaul Singh and Kalyan Singh, are also pursuing their studies. The former is in the final year of MBBS at the Lahore medical college, while the latter has got admission in LL.B. Kanwal Kaur from Lahore is a known poetess of Pakistan who writes in Punjabi as well as Urdu. At the time of the Partition, most Sikhs and Hindus who were doing brisk business at Lahore were either massacred or were forced to migrate to India. However, it is for the first time after Partition that Hamir Singh opened a cloth shop in Gulbargh, a shopping centre of Lahore, last year. The Sikhs of Peshawar, who are known for their small-time businesses, have for the past couple of years started sending their wards to colleges and universities. Rajan Singh of Peshawar is well versed in computer engineering and is bringing out a magazine, Khalsa Times, in Punjabi, Urdu and English. Another Sikh from Karachi, Anil Singh, is doing MBBS in Karachi, while his two sisters are also into the same profession. Interestingly, Pakistani Sikhs are taking part in sports and cultural activities too. They have even formed their own cricket team. 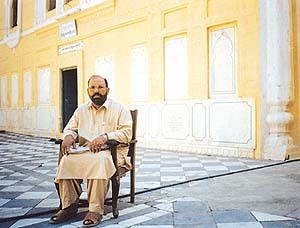 Kalyan Singh, a young boy of Nankana Sahib, has acted in a number of feature films and one-act plays. He has featured in movies like Laila Majnu, Kuri Panjaban and a play named Kesri Painda on Punjab problem, produced by Niaz Mohammad. The co-chairman of the Pakistan Sikh Gurdwara Prabandhak Committee ( PSGPC) said Sikhs in Pakistan do not want to get absorbed in government jobs as trade or business has always been their first preference. He said that though Gen Pervez Musharraf had offered to make his son Sikandar Singh a lieutenant in the Pakistan army, he had politely refused as he wanted to start an agro-based business. The importance given to Sikhs in Pakistan has started bringing their Hindu brethren into the Sikh fold. Though Sindhis are dedicated followers of Guru Nanak Dev and accept the Guru Granth Sahib as their holy book yet some of them converted to Sikhism owing to the ‘special treatment’ given to the community by the Pakistan government. Hindus do not have any top leader to protect their human rights in Pakistan. Child marriage is prevalent among both Hindus and Sikhs in Pakistan. Charanjit Singh from Peshawar said due to the marginal strength of both communities, they are compelled to marry their children with cousins. The scope of marriages could be broadened if both India and Pakistan allowed their Hindus and Sikhs to get married in each other’s countries. The condition of most of the Sikh shrines in Pakistan continues to be deplorable, the tall claims of the PSGPC notwithstanding. After the formation of the committee on April 11, 1999, a few gurdwaras out of about 175 have been given a facelift with a grant of Rs 1.5 crore. Though the PSGPC must be given credit to give a new look to Gurdwara Nankana Sahib, Gurdwara Sacha Sauda and Gurdwara Dera Sahib, the management has miserably failed to maintain the maryada in the shrines. I saw siropas (robes of honour) being presented to senior police officials at Gurdwara Nankana Sahib by PSGPC president Sham Singh in gross violation of the maryada (Sikh code of conduct). Tiny shops were allowed to operate day and night within the complex of Gurdwara Nankana Sahib. The main gate of Gurdwara Shaheed Daleep Singh was being used for ironing clothes. Many gurdwaras did not have parkash of the Guru Granth Sahib. Gurdwara Diwan Khana, Chuna Mandi, Lahore, which is in a dilapidated condition, has a toilet constructed by a Muslim caretaker inside the parikarma of the gurdwara. Such an aberration was also seen in Gurdwara Bhai Taruji, Lahore. You even find Pakistanis dance to popular filmi songs when Sikh jathas visit Pakistan. The purpose of having the PSGPC stands defeated if it cannot restore the maryada of Sikh gurdwaras in Pakistan. THE whereabouts of India’s five most wanted Sikh militants still remain unknown. Diplomatic and intelligence sources, however, claim that to further ISI designs these Sikh ultras meet a few ‘key’ persons from the Sikh jathas that go to Pakistan. Five Sikh militants figure among India’s 20 most wanted persons. They are: Gajinder Singh, self-styled chairman of Dal Khalsa International; Parmjit Singh Panjwar, chief of Khalistani Commando Force; Wadhawa Singh Babbar, chief of Babbar Khalsa International; Ranjit Singh Neeta, president of Khalistan Zindabad Force; and Bhai Lakhvir Singh Rode, chief of International Sikh Youth Federation. Earlier, these ultras mingled freely with the members of Sikh jathas, which was clear from the interrogation of Sukhchain Singh, alias Mann, who had visited Pakistan with the Sikh jatha in 1998 and had met Parmjit Singh Panjwar. However, the Pakistan Government had directed these Sikh militants, operating from its soil, not to meet any pilgrim publicly when the Indian Government declared them ‘most wanted’ after the attack on Parliament on December 13, 2001. Unlike in the past, not a single inflammatory slogan was raised by any radical Sikh outfit at Sikh shrines in Pakistan on the occasion of the birth celebrations of Guru Nanak Dev last year. The banners expressing separatist thoughts were replaced with ‘welcome and congratulatory’ messages which had been put up by the Punjab (Pakistan) tourism department. The shift in the policy of the Pakistan Government was an apparent move to tell the world that it was not promoting secessionist movement anymore in the aftermath of the attack on the Indian Parliament by pro-Pakistan militants. To make its presence felt, the second rung of leaders of radical Sikh organisations was present in Sikh shrines during the birth anniversary of Guru Nanak Dev at Gurdwara Nankana Sahib. Sikh leaders from foreign countries, especially from the UK and the USA, delivered inflammatory speeches and reiterated their resolve to create a separate Sikh state while speaking from the stage at Nankana Sahib. Some Sikh leaders from abroad distributed literature, advocating the demand of a separate state for Sikhs. Giving clear indications that they did not accept the authority of the PSGPC, the leader and the deputy leader of the SGPC jatha refused to exchange siropas at a function held in the birthplace of Guru Nanak Dev on the occasion of his 533rd birth anniversary. Though Alwinder Paul Singh Pakhoke and Bhupinder Singh, leader and deputy leader of the jatha, respectively, were present at the function, they quietly walked out a few minutes before the beginning of the ceremony. Gen Pervez Musharraf had not bothered to invite the SGPC leadership even though he held a closed door meeting for about 40 minutes with the UK and USA-based radicals, including Pritpal Singh, convener of the American Sikh Gurdwara Prabandhak Committee; Gurmeet Singh Aulakh, president of the US-based Council of Khalistan; Manmohan Singh Khalsa, UK-based Dal Khalsa leader; and Ganga Singh Dhillon, president of the Nankana Sahib Foundation (in the USA). Apart from discussing demands of Sikhs at length, General Musharraf agreed in principle to convert Nankana Sahib into one of the most modern cities of Pakistan. By ignoring moderate Sikh leaders from India, General Musharraf has given an indication of the ‘hidden agenda’ of Pakistan. Keeping this in view, the SGPC chief, Kirpal Singh Badungar, has reiterated that siropas won’t be exchanged this time too. MEMBERS of Sikh jatha are shadowed by ISI sleuths the minute they cross over to Pakistan either from the Wagha checkpost or from Attari railway station. In fact, the driver of a bus in which pilgrims are ferried to various Sikh shrines could actually be a senior ISI officer. This was confirmed when an SHO of Nankana Sahib ‘inadvertently’ saluted the bus driver of the bus. The activities of the pilgrims are minutely noticed. When some other journalists and I visited the office of Lashkar-e-Toiba, the Pakistan-based Sikh militants asked about the purpose of our visit. Such a query stunned us as it meant that information had been exchanged between the ISI and the militants. The only query put to Lashkar activists which remained unanswered was: "Do the Pakistan-based Sikh militants work in tandem with Muslim ultras?" We were stunned to learn that even 5-year-old children receive training in handling firearms and explosives. Their trainers are Afghan mercenaries. Violation of maryada: A caretaker is seen with shoes and with his head uncovered in the parikarma of Gurdwara Diwan Khana in Lahore. THE Pakistan Gurdwara Prabandhak Committee (PGPC) was formed on April 11, 1999, to mark the tercentenary celebrations of the birth of Khalsa Panth by the then President of Pakistan. The appointment of Lieut-Gen Javed Nasir, a former chief of the ISI, as founder chairman of the PGPC had infuriated the SGPC. When the SGPC had refused to send jathas in protest against the formation of the PGPC, the Government of Pakistan inserted the word ‘Sikh.’ Thus, it was re-christened as the PSGPC (Pakistan Sikh Gurdwara Prabandhak Committee). The office of the PSGPC opened in the main building of Gurdwara Nankana Sahib, but it closed after a year. The five-member committee was disbanded and Sham Singh was made co-chairman of the PSGPC. Notwithstanding tall claims, Pakistan’s aukaf board failed to finalise the constitution of the PSGPC even after four years of its formation. Elections have never been held to elect the body in a democratic way. The SGPC and some of the founder members of the PSGPC have levelled charges that Sham Singh was originally a Muslim who had converted into Sikhism. This charge was, however, strongly refuted by him. The background of Sham Singh, who is well-versed in Gurbani, thus continues to remain shrouded in mystery.